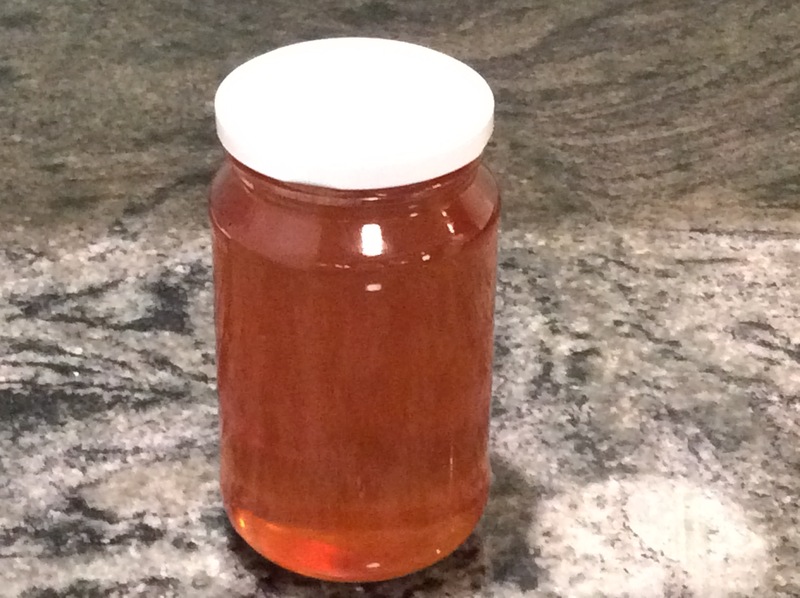 It’s guava season, and making guava jelly is a perfect way to use up a huge crop if you have a tree in the back yard. 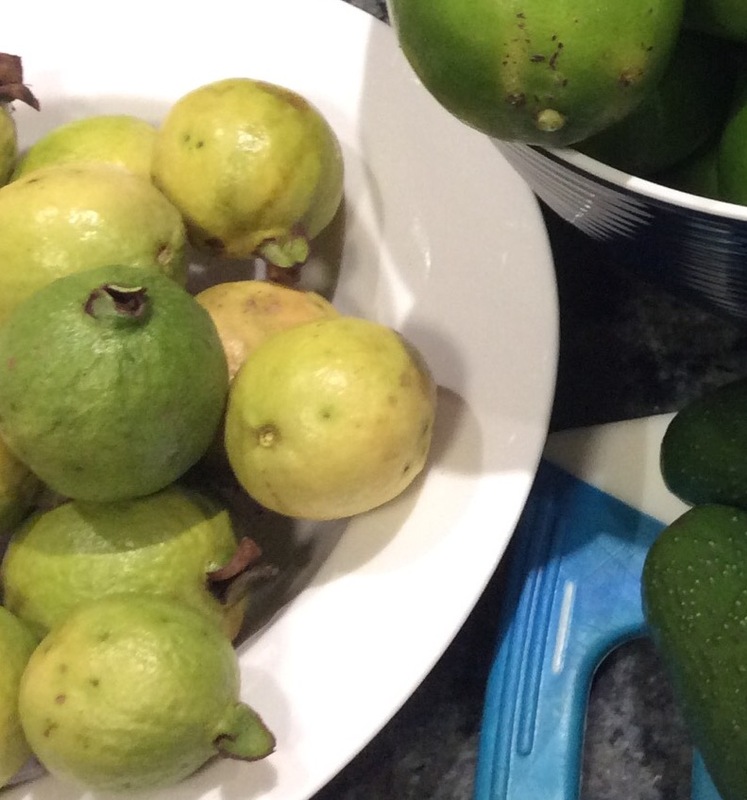 Unfortunately the possums got to my tree before I did, and the ground was littered with guavas with one bite taken out, but I did manage to salvage enough for a batch of guava jelly. Guava jelly is delicious with roast pork, or eaten on its own as a preserve as you would a jam. It is also superb with cheese, particularly blue vein. 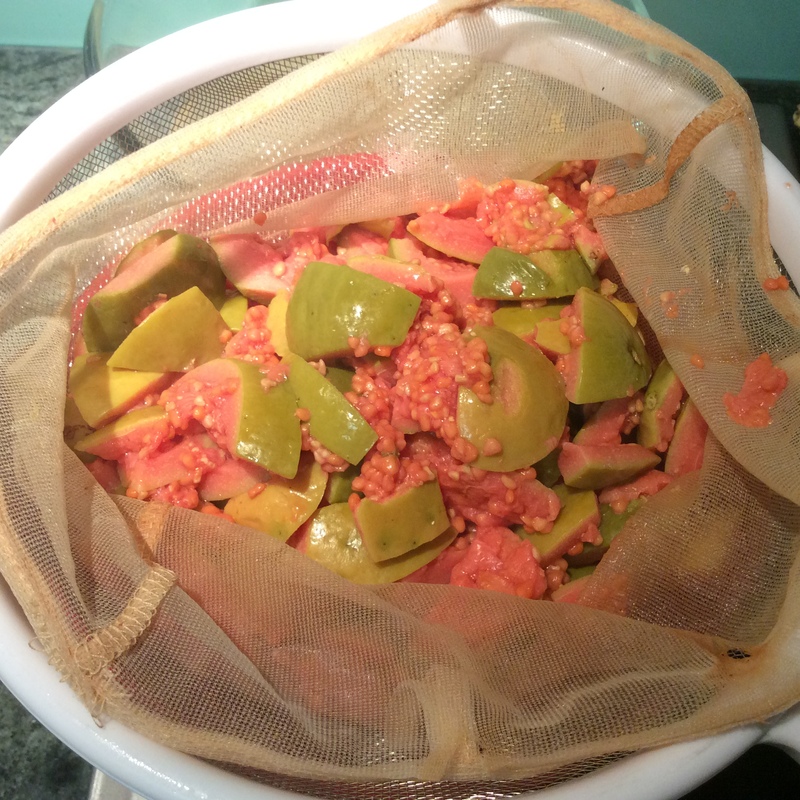 To make guava jelly you will need guavas (I had around 12 smallish guavas), sugar, water, and either some limes or lemons. 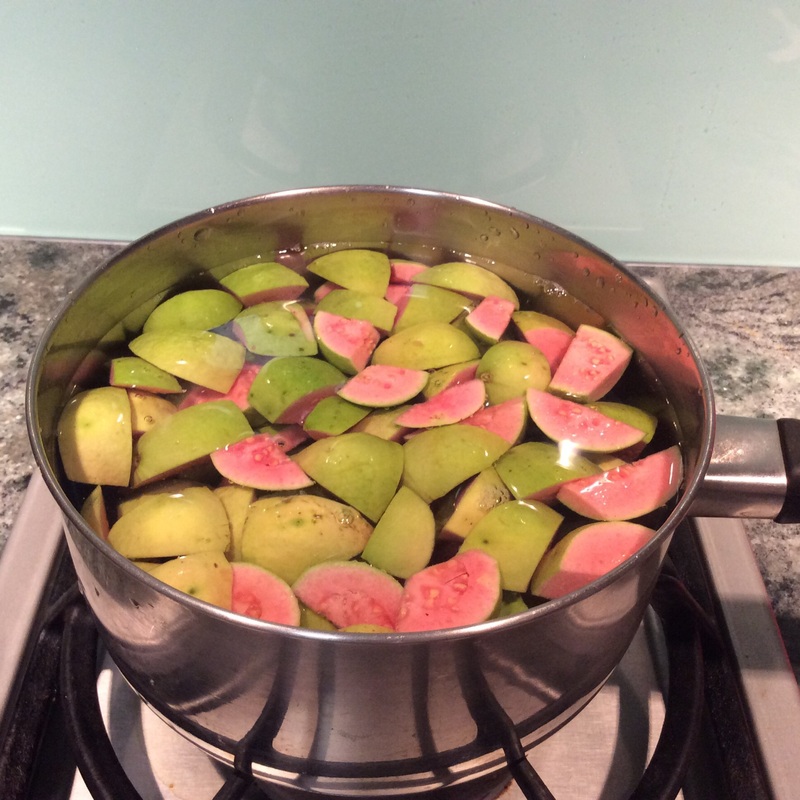 Chop the guavas roughly, and place in a pan, just covering them with water. Bring to the boil and simmer, with the lid on, for around half an hour. Strain through a cloth in a sieve for a couple of hours at least, preferably overnight. Important, do not press down or squeeze the fruit while doing this, allow the juice to slowly drip out. After all of the liquid has dripped out, you need to test for the pectin content. Take one teaspoon of the liquid and mix with three teaspoons mentholated spirits in a glass, and tip onto a saucer. If there is one large clot, your mixture is strong in pectin, and you can add sugar cup for cup. If it has several clots (like I had, see below), add 3/4 cup of sugar to each cup of liquid. In the end I had three cups of liquid, and added three X 3/4 cups of sugar. At this point, put the sterilised glass jars you are going to use in the oven on low heat, around 130 degrees, as well as a pouring jug (I use a glass oven-proof one). 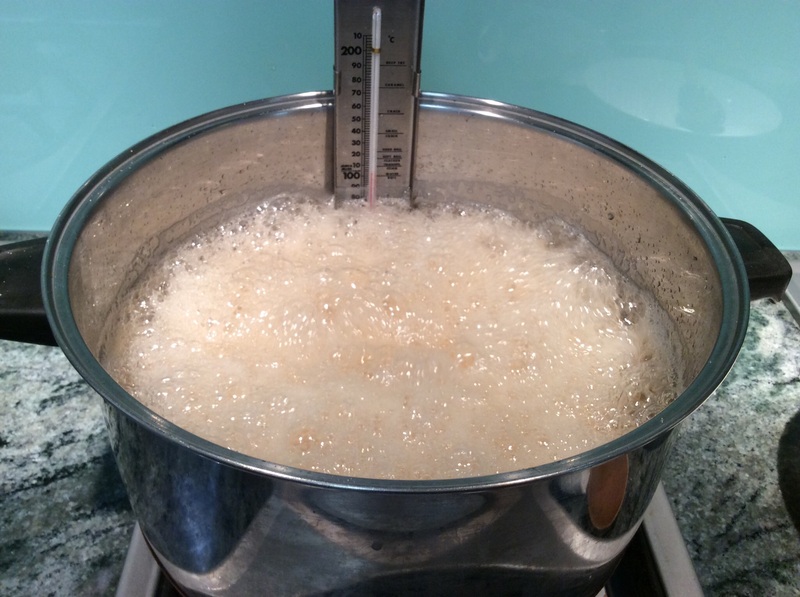 Add a candy thermometer to the pan if you have one, and slowly bring the mixture to the boil, ensuring that the sugar is fully dissolved before the mixture boils. Add the strained juice of two limes or one lemon. You will need to adjust the amount for your own quantity, but the proportion is around two tablespoons or lemon or lime juice to two cups of sugar. Lime juice is best with guava jelly if you have it. 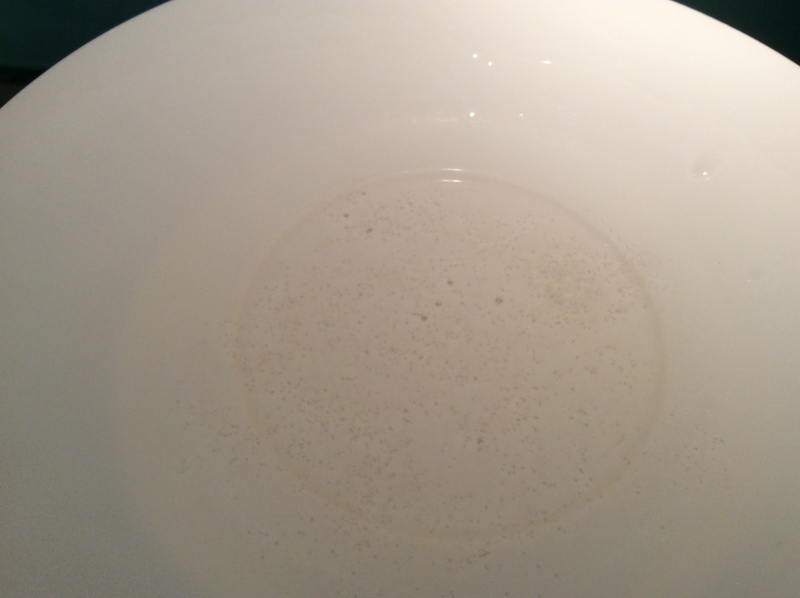 Allow to boil until it gets to jelling point, which will be pretty fast. Mine took only 10-15 minutes. If you have a themometer, jelling point is 104 degrees, or you can use the spoon or saucer tests, which I have described in other preserves recipes. The other way in which you can tell is the smell, which changes at the end (it will smell amazingly good! ), and the bubbles which get larger and start spitting – see picture. Take the jelly off the heat, and prepare your jars. Pour relatively quickly into the prepared jars, or it will set in the pan, which you don’t want to happen! Pour slowly down the side of the jars, and seal immediately. My batch made one and a half jars, which was OK, considering I had shared most of the fruit with the possums in my back yard!